If you are looking to start a church podcast to reach a global audience, a business podcast looking to qualify leads, a school looking to boost education through podcasting, an entrepreneur looking to get more sales, I’ve helped them all start and launch successful podcasts. Hear what our members have to say about the School of Podcasting and my consulting services on our Testimonials Page. Because I've been podcasting since 2005, I can help you learn how to podcast and avoid the common mistakes.. By joining now, you will receive live podcast consulting, step by step tutorials showing you how to use Podcast Tools. The best part it starts as low as $20 a month (and you can unsubscribe any time). 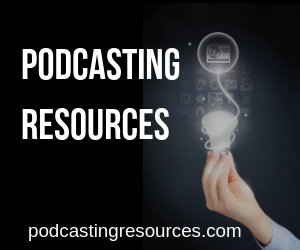 There are some great books about podcasting (I’ve read most of them). But if you get stuck, that book won’t help. At the School of Podcasting your email will be answered quickly and get you back on track. If you need more help you can get your question answered at our weekly LIVE training sessions. These “round-tables” are not just educational but you will be able to network with other podcasters and set up cross promotional opportunities. Think of it as an “Internet Radio/TV Show.” We can get into “what it is” later, instead lets talk about what it DOES (after all we know what a car is, what's more important is what it does). Podcasts delivers audio and video automatically to people all over the WORLD who are hungry for your content. It does it automatically, and it does it for free (or if you decide to make money from your podcast I have resources and tools to help you make money from podcasting). What it means is you can reach a global audience without a radio signal. It means your listeners can listen whenever they want, and if they have a portable player (completely optional) they can listen wherever they want. I remember the first time I spoke into a microphone in the basement, and a few weeks later I got a voicemail FROM GERMANY. An e-marketer.com article stated they expect the podcast audience to grow by 251%. The estimated spending for advertising online to be $240 million in 2008 (going up to $435 million by 2012) In 2007 Wizzard Media (a podcast hosting solution) released a report stating they had 1 Billion downloads in 2007. Your audience awaits. When I started podcasting, before I knew it I had 100 people listening. Now I have shows that have over 1000 people listening. Let me guide you to success. I want to be your Personal Podcast Coach.